Our UX and front-end teams have been super busy over the last few months, and today we’re excited to unveil our new, improved EVRYTHNG dashboard! The dashboard has been re-designed to provide a better user experience and be fully responsive. We’ve also enabled full customization and localization on a customer-by-customer basis. Why? Our customers are incredibly diverse, with products ranging from connected devices like smart plugs, toothbrushes and lights; to CPG products like packs of gum, bottles of wine and cans of soda. Their requirements are both very specific and diverse, so it makes sense that we provide them with the most flexible, adaptable admin and analytics capabilities in our platform. To support different web components frameworks like Polymer or Angular 2.0 in coming releases, we’ve redeveloped the portal so that every module is an individual widget, or separate application. This means that our customers can build their own unique data dashboards for different users or lines of business, according to the kinds of data they want to view and manage. Using our new customization tool you can add, remove or modify data views within your dashboard. 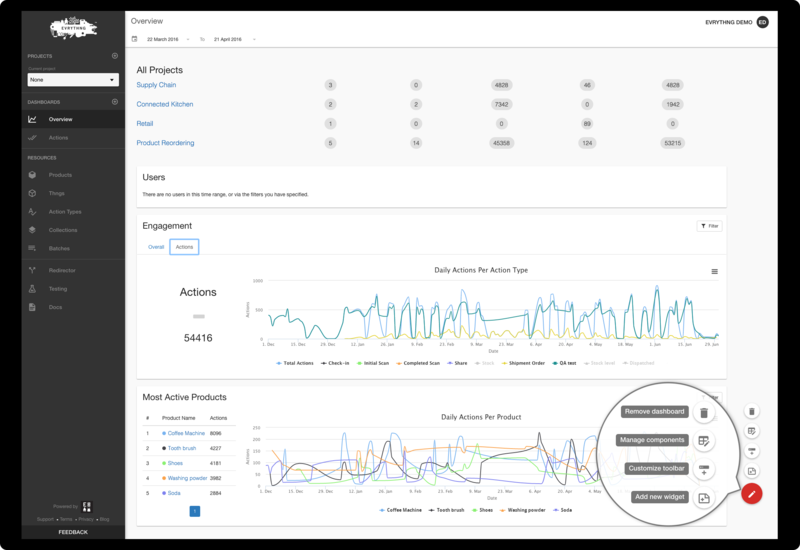 These views can merge product data, or data from Collections, Actions and Locations, with data from in-house CRM or ERP systems to create your own bespoke, integrated dashboard. All existing modules within the EVRYTHNG dashboard now come as out-of-the-box widgets that can be modified, reused or removed. To simplify how enterprises and service providers manage their services, we’ve introduced roles. Roles define access levels, like API permissions and portal privileges. Multiple roles can be created within each customer account on the portal, typically mapping to different functions – like Business Analytics or Support. Users who share the same Role can also be provided with custom Role-based dashboards. Designed to be fully responsive for any mobile or web device. To provide a better user experience on smaller devices, we’ve moved the main navigation to the left hand side and have introduced a fully flexible menu structure to allow for higher number of pages to be visible. And to support our global product manufacturers as their deployments grow, the portal now supports full localization and allows customers to apply their own brand look and feel. 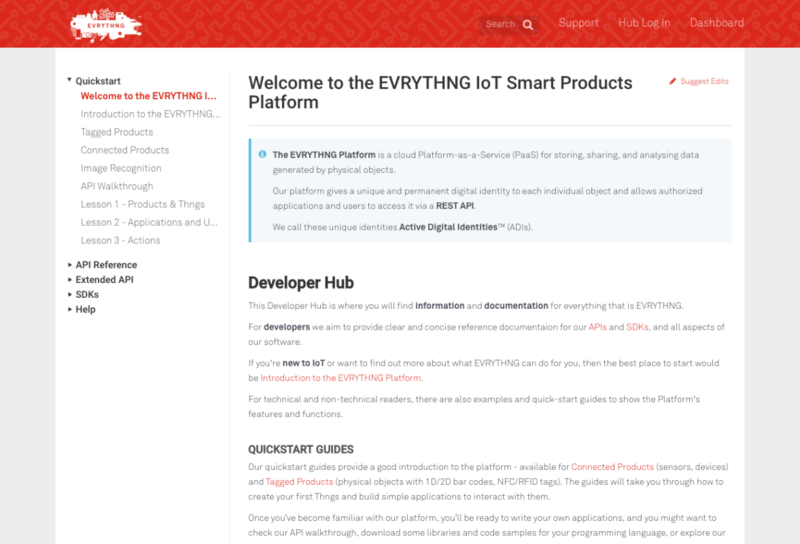 We’ve also revamped our developer site, with updated documentation and a cleaner look. This makes it easier to to find the resources you need – whether SDKs, tutorials or API guides. Check it out at: https://developers.evrythng.com.